On stands now! Our magnolia leaf tray by Ben Caldwell has been featured in Garden & Gun’s gift guide. 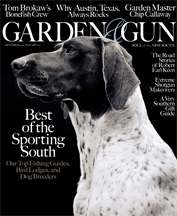 Have you picked up a copy of Garden & Gun magazine this month? This quality publication is out of Charleston, SC, and we’re thrilled to be included in their December 2009/January 2010 issue. Associate editor, Haskell Harris, included us in their It’s a Southern Thing gift guide, which features 20 unique items from across the South. 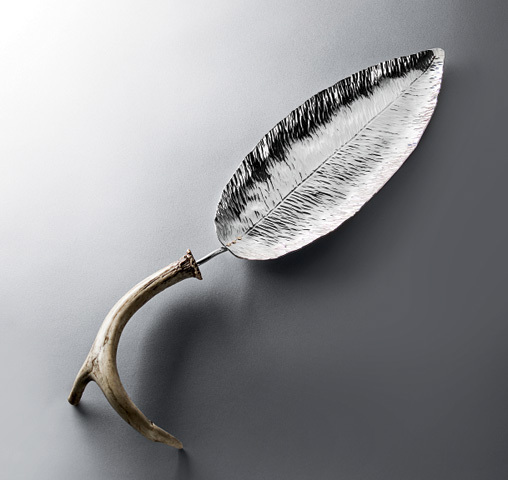 At the magazine’s request, we had Ben do a silverplated magnolia leaf tray with antler handle ($450), which we shipped to Brian Woodcock’s studio in Atlanta, GA, to be photographed for the issue about a month ago. If you have time, check out Brian’s website. His food, fashion and product photography is truly amazing. Note: this exact piece has been sold to a customer out-of-town, but we have several more silver trays available. For info, call Ellen Caldwell at 615-298-5800, or send an email: ellenc@caldwellcollection.com.